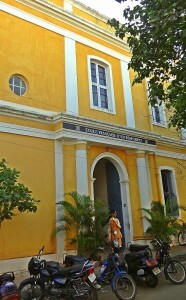 The Union Territory of Pondicherry (now called Puducherry) actually comprises a small district separate from the state of Tamil Nadu with its own Chief Minister. 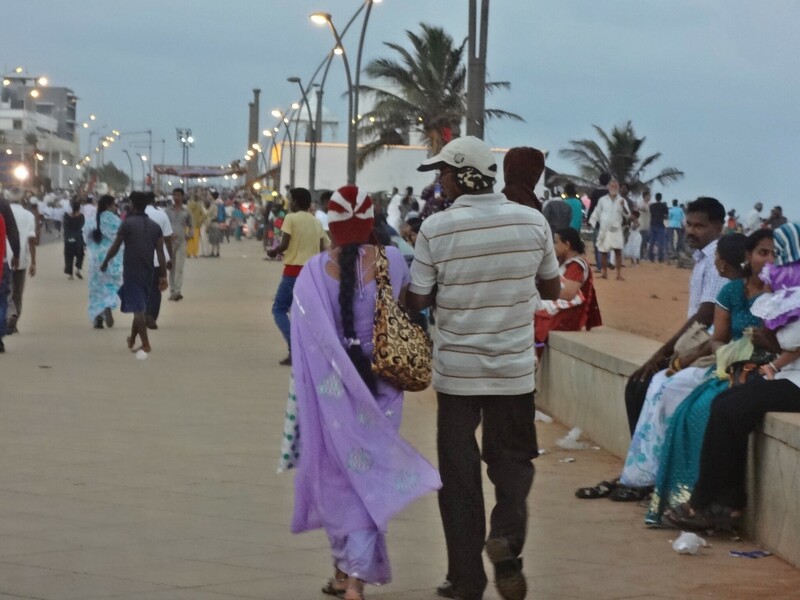 The city itself is on the sea about 100km south of Mammalipuram. It was owned by the French until 1954 and there are local people who speak French perfectly. Shocking though it seems now, the city was once divided into the French Quarter called Ville Blanche (White Town) and the Indian Quarter called Ville Noir (Black Town). Still referred to by the same names on maps, the two sections are separated by a narrow canal and the difference between the two towns is striking. 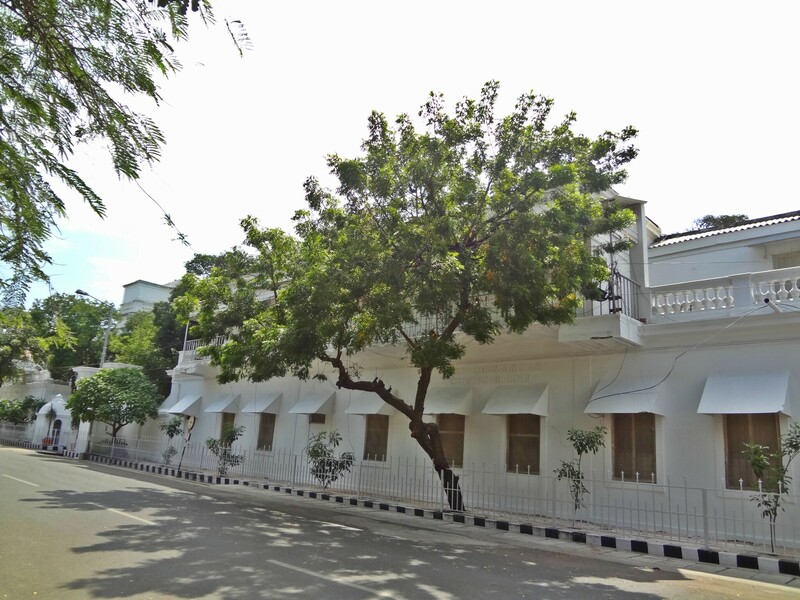 White Town is closest to the sea and has wide tree-lined streets with French names and colonial style buildings. With its 2km sea wall and Promenade, and high-end restaurants and heritage hotels, it’s a little like a small town on the Cote d’Azure. Black Town has narrow, crowded, and busy streets and is like every other small town in India. Needless to say, people now move freely about the city. The Promenade on the seafront is a busy place in the evenings with people walking briskly for exercise and others strolling about chatting with their friends. The temperature at this time of year is perfect. About 25C to 30C during the day with an ocean breeze dropping to the low 20s in the evenings. We noticed quite a few people walking around with what appeared to be headphones except that they didn’t quite fit into the headphone wearing demographic (granny in a saree). We realized that they were wearing earmuffs for the cold! If you look closely at this photo, the husband is wearing earmuffs and the wife has a wooly hat. 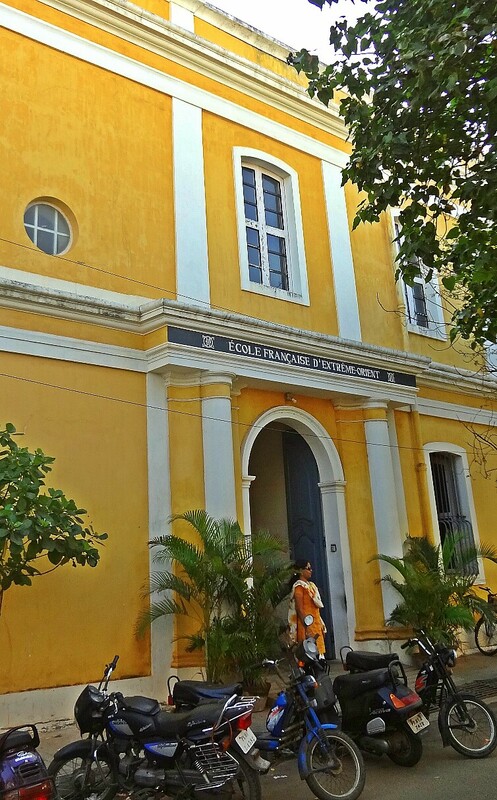 Pondicherry was a trading port in antiquity and interestingly, remains of Roman amphorae dating to the 1st and 2nd century AD were discovered at Arikamedu, an archaeological site about 7km south of the city. The amphorae contained garum (fermented fish sauce), olive oil and wine. Incidentally, the ones carrying wine were the most plentiful! Presumably, the Romans brought these goods to India and went back with pepper and spices since pepper was worth more than gold at that time. 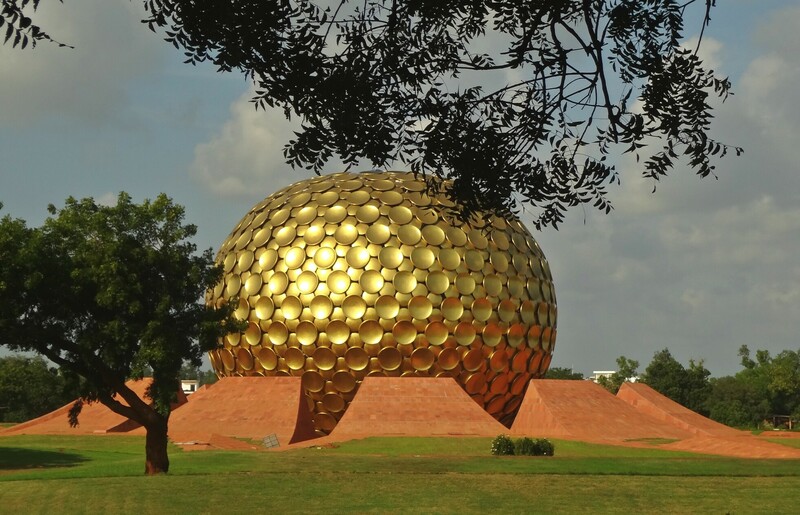 Speaking of gold, just outside the city is the experimental township of Auroville which has a huge building in the form of a gold sphere called the Matrimandir, at its centre. Auroville was founded by a Frenchwoman called Mirra Alfassa (also known as ‘The Mother’) to be a place where all nations could live in harmony and not be separated by race, politics or religion but pursue a higher consciousness. Over 2,000 people from a number of different countries live in Auroville and the Matrimandir is the meditation centre. The Mother was closely linked with Sri Aurobindo, a philosopher and yogi who founded the Aurobindo Ashram in Pondicherry. No ‘White’ and ‘Black’ towns here but I couldn’t help wondering how many poor Indians could have been fed or educated with the money it took to build the Matrimandir.